Aquinnah Town Hall is located at 65 State Road, Aquinnah, MA 02535; phone: 508-645-2300. 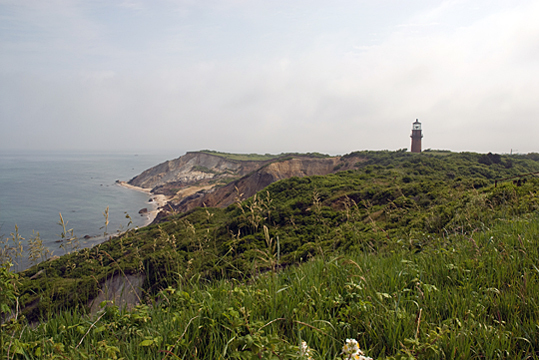 Photo: Clay Cliffs and Lighthouse, Aquinnah, MA, photographed by Arwcheek, 2008, en.wikipedia.org, accessed March, 2011. Formerly the Town of Gay Head (incorporated in 1871), residents voted to change the name which became effective in May of 1998. The Town is noted for its mile-long, dangerous, rocky cliffs. Aquinnah is the western most town on the Island of Martha's Vineyard which lies about 5 miles south of the tip of Cape Cod.